6 Crazy Dog Behaviors Explained! If you’re a pet parent, you’ve probably been a witness to some pretty bizarre behaviors. You might often wonder why they do the things that they do or if their seemingly strange actions are normal. Don’t worry! Just let us help demystify these 6 crazy dog behaviors for you! Walking in Circles Before Lying Down – This is an old trait developed in your canine friend long, long ago. Back then, wild dogs would create a comfortable place to sleep by walking in a circle several times in order to flatten down tall grass and chase away snakes and large insects. It’s a behavior that’s been hard-wired into dogs to help them build a safe “nest” for them to sleep in. Kicking the Ground After Eliminating – Does your dog kick at the ground after he does his business? You might think he’s trying to bury it, but he’s actually trying to mark his territory. Dogs have scent glands in their paw pads, so when they kick out their back legs, they’re spreading the scent and marking their territory. This is typical of non-neutered males, but neutered males and sometimes females will do this as well. Taking Forever to Pee – For humans, going to the bathroom is simply going to the bathroom. For dogs, however, it involves an entire process and is a way of communicating. Your pup takes in the many different smells left by other dogs or animals before urinating. He might even be taking his sweet time to make sure that no other dog has previously gone in the spot he’s considering using. Try your best to stay patient if Rover takes a long time scouting out the perfect spot to pee; he’s not doing it to irritate you, we promise! Moving Away When You Try Patting His Head – Take note of how you’re petting your pup. Are you trying to pat his head more than anything? You probably don’t like it when someone does this to you, and dogs don’t like it either. They don’t see it as an expression of affection but rather as an action that signals dominance (and it doesn’t feel the best either). Try stroking your dog, particularly on the side of the face, under his chin, or on the front of his chest to show affection. Kicking Their Leg During a Belly Rub – Do you notice a “special spot” on your furry pal’s belly that, when you scratch it, her leg starts kicking? You might think she’s enjoying it, but it’s actually driving her a bit crazy. Dogs shake or kick their legs when you scratch them in certain spots because of their scratch reflex, a completely involuntary reaction that happens when a scratch or tickle occurs in those spots. It’s as irritating to your dog as a bug would be and activates the nerves under her skin. Choose a different spot to scratch – your dog will appreciate it! Rolling in Smelly Stuff – Dogs and humans have totally different ideas when it comes to what smells good. We might want to envelop ourselves in a freshly-washed blanket. Dogs, however, love the idea of rolling around in piles of manure or road kill. They want nothing more than to get close to the smell as possible. 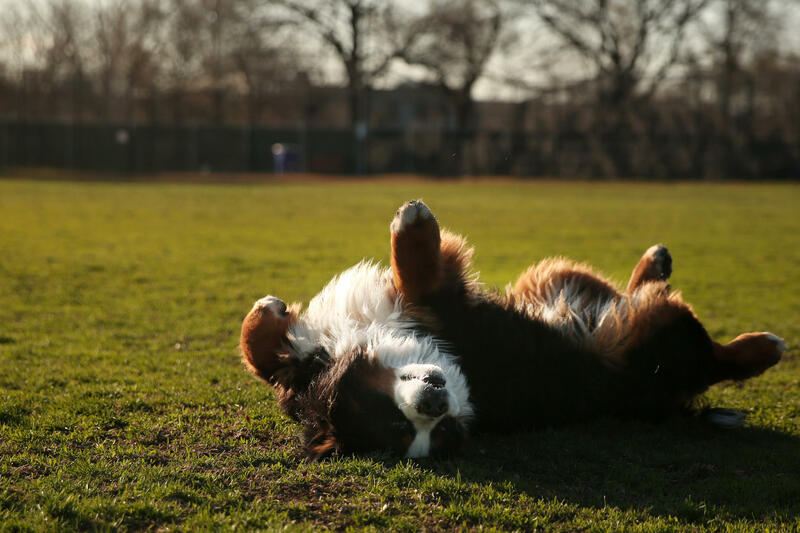 The habit of rolling around in this smelly, unpleasant stuff is instinctual; dogs were once hunters, and in order to sneak up on their prey successfully, they had to do their best to smell like something that wasn’t a dog. Dogs love you and love hanging around other dogs as well, but they want to feel secure and safe at the same time. At BauserHaus, we have dog-loving professionals who are savvy with dog-speak and know how to care for your furry buddy while you’re gone. Your dog will be used to seeing the same smiling, friendly faces at BauserHaus and will grow so comfortable that he won’t want to leave! Call us at (314) 961-3911 or visit our website at www.bauserhaus.com to learn more about us! This entry was posted in Fun information and tagged BauserHaus STL, dog behaviors explained, doggie daycare STL, weird dog behaviors, why does my dog do that?. Bookmark the permalink.